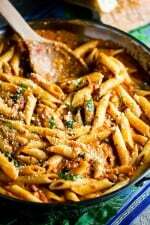 This Classic Penne alla Vodka recipe is without doubt one of our all-time favorite Italian-American pasta dishes. 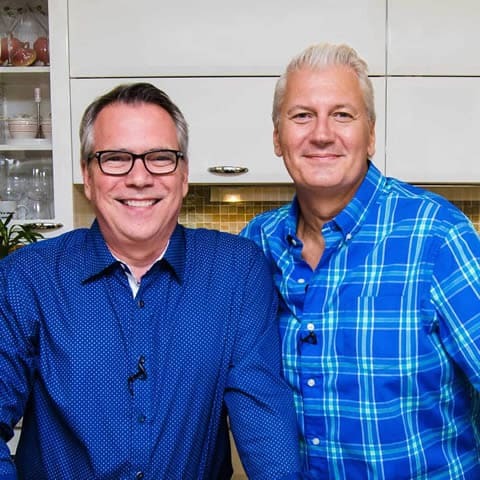 It is truly the definition of “make-you-feel-good” food. Going the distance and making the homemade marinara is a must. And then the dish comes together very quickly. Well, as mentioned, the basis for an outstanding Penne alla Vodka dish is a robust Homemade Marinara. This can easily be made in advance. I make a large batch and then freeze in several storage containers. This marinara is bursting with Italian flavors and is just so wonderful. Start building the flavor profile of Penne alla Vodka by sautéing onions, garlic, herbs and red pepper flakes. The smell emanating from you kitchen will begin to attract the attention of hungry house dwellers before you know it. Now, let’s really fire things up! Very carefully, add the vodka and the use a long match to ignite the alcohol. Be careful when doing this, and be sure to stand back. 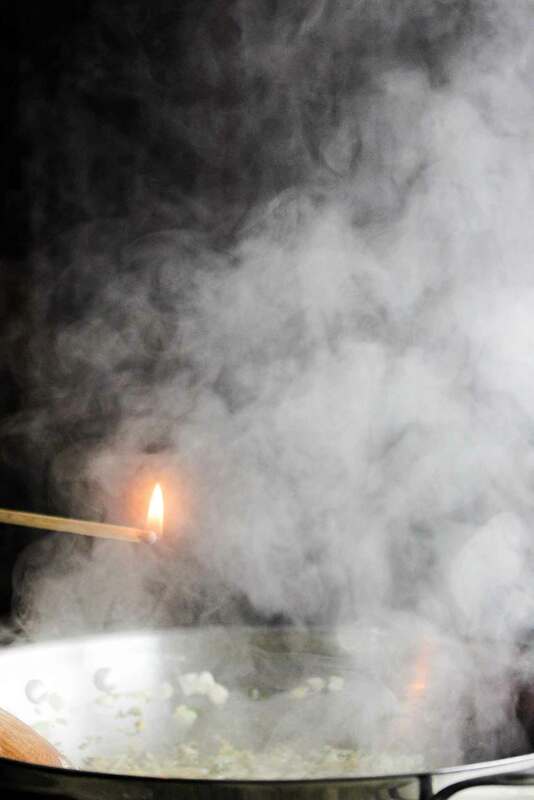 This is a technique called flambé and though it’s not completely necessary, it does improve the overall flavor of the sauce. Next goes in the prepared marinara sauce. And then what gives Penne alla Vodka it’s classic pink appearance is the addition of cream. We think just a touch of heavy cream gives the sauce a wonderful texture and luxurious taste. Americans are just crazy about this dish. And I can tell you one thing…the Loon and I are two Americans that flip for a good Penne alla Vodka. Some might ask, but why vodka? Does it really enhance the flavor? I’ve had a basic marinara sauce with sautéed aromatics, and it’s good. But there is something about adding vodka to the sauce and then flambeing it that in my estimation…really does make a difference. 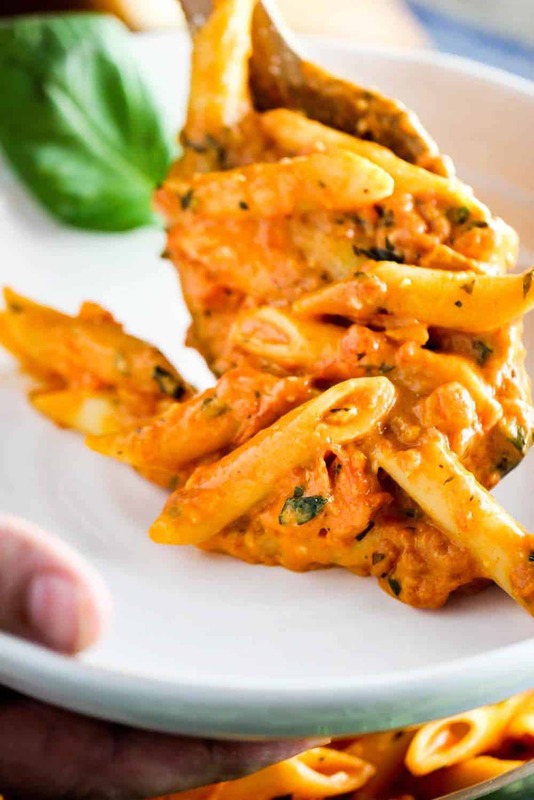 But in the meantime, you should really whip up a batch of this amazing Classic Penne alla Vodka. This Classic Penne alla Vodka is just that: Classic, vintage and perfectly Italian-American at it best. 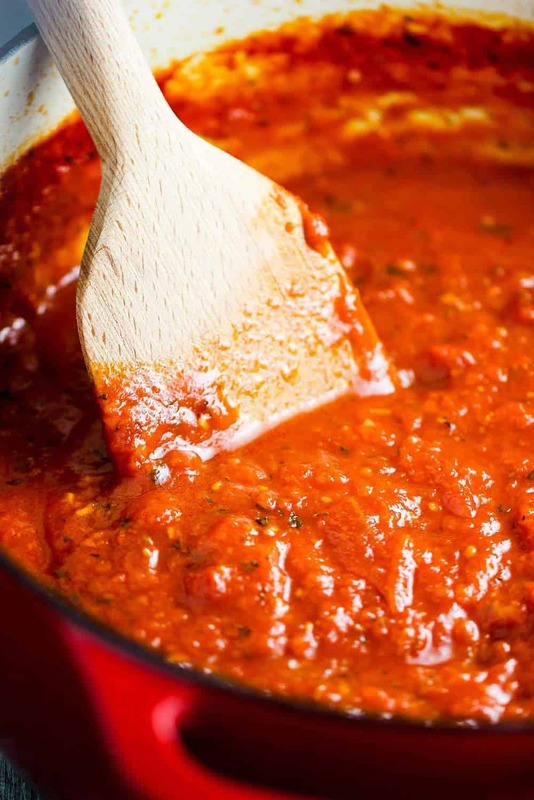 Make the Homemade Marinara to ensure the best taste you could ever imagine. This is pasta comfort heaven. 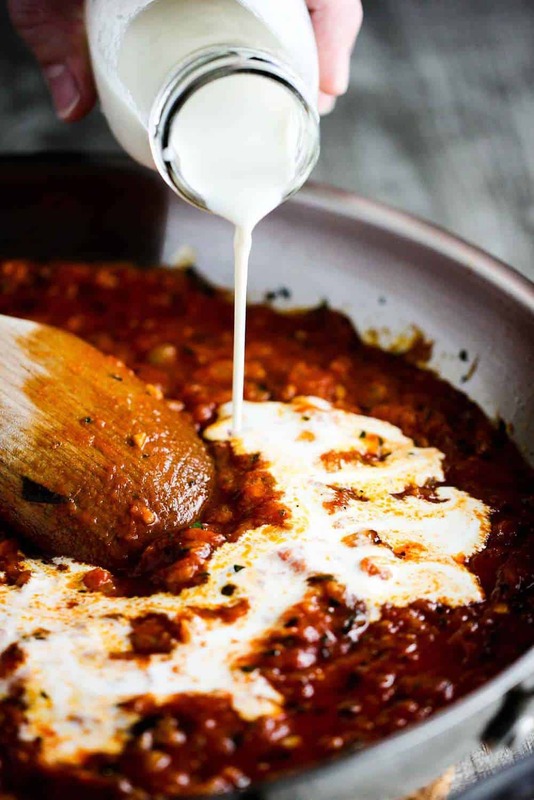 Make the homemade marinara sauce and set aside (can be made up to 3 days in advance, stored in the refrigerator). 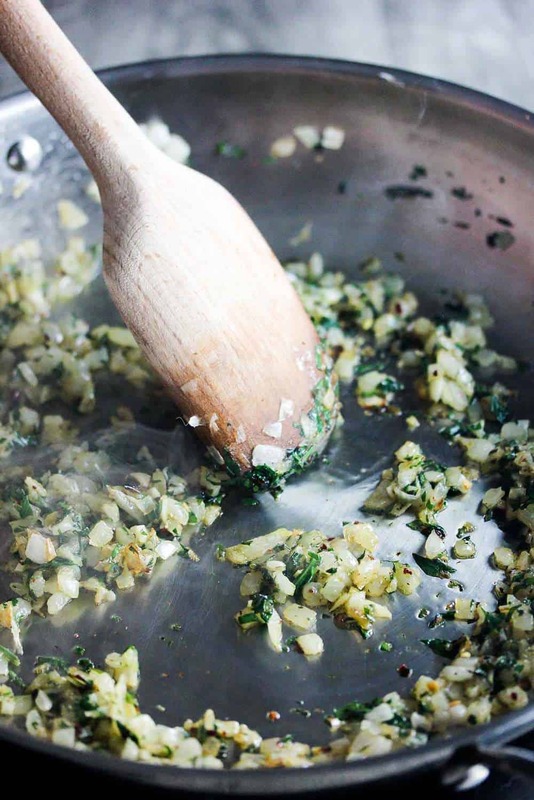 In a large pan, heat the olive oil over medium-high heat. When the oil is just starting to smoke, add the onions and lower the heat to medium. Cook until starting to soften, about 3 minutes. Add the basil, parsley, and red peppers (to taste), cooking and stirring for about 30 seconds. Remove the pan from the heat and carefully add the vodka (stand back when doing this). If the vodka does not flame, very carefully light a long match and ignite. (again, stand back). Once flame has died down, return the pan to the heat and add the marinara sauce and simmer for about 5 to 6 minutes. Add the cream and bring to a boil. Boil for 3 minutes until slightly thickened. Meanwhile, cook the penne in a salted pot of water for 8 minutes, or until al dente. Drain the pasta and transfer it to a pasta bowl. Bring the sauce to a simmer again and stir in 1/2 cup of the Romano cheese, and season with salt and pepper. Pour the sauce of the pasta and serve with remaining cheese on the side. Wow, this looks so delicious. 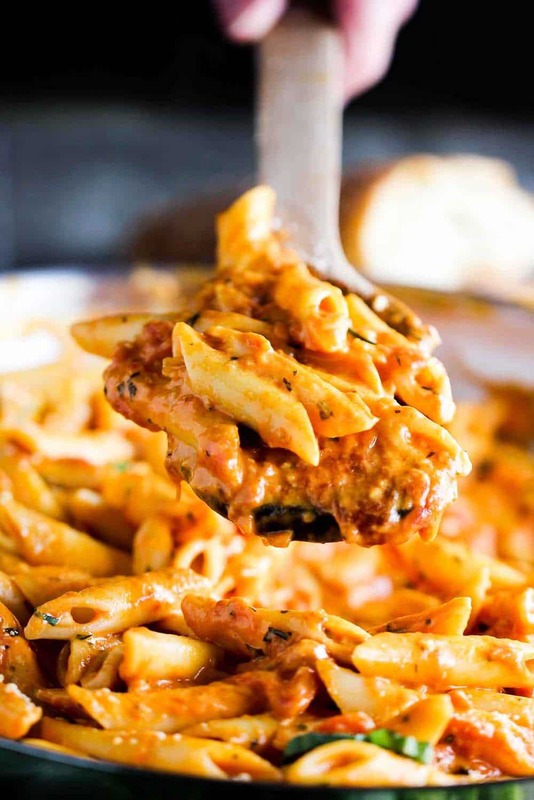 Penne alla vodka is my favorite dish to order at an Italian restaurant. 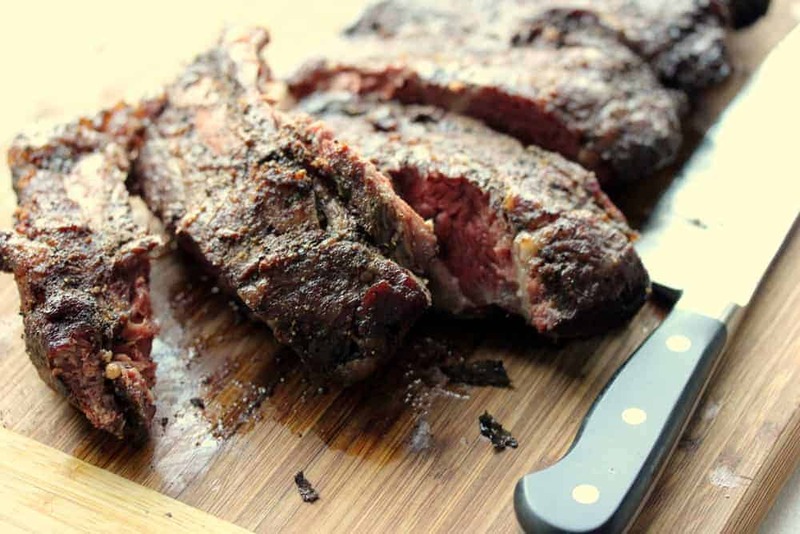 Can hardly wait to make this at home for the family!